This project focuses on the development of metrics and experimental methodologies for researchers and practitioners to use to evaluate different types of collaborative environments, such as large-format surface computing systems or multi-display systems. In particular, we are focusing on metrics and experimental methodologies for assessing the effectiveness of a collaborative environment to facilitate information sharing among co-located groups. 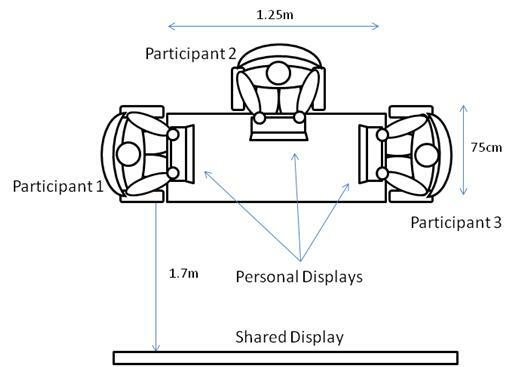 Through a series of mixed-methods laboratory studies of different collaborative activities in multi-display groupware (MDG) environments, including environments with multiple laptops and a shared wall display, and with multiple tablets and a shared tabletop display, we developed metrics for understanding the teamwork and taskwork impacts of particular MDG designs. These methods have been published in the associated papers, as well as James (Jim) Wallace’s PhD disseration. Wallace, J.R., Scott, S.D., MacGregor, C.G. (2013). Collaborative Sensemaking on a Digital Tabletop and Personal Tablets: Prioritization, Comparisons, and Tableaux. Proceedings of CHI 2013: ACM Conference on Human Factors in Computing Systems, April 27-May 2, 2013, Paris, France.